Irish harp earrings are featured in a sterling silver stud design along with gold plated drop styles. This section of Irish harp earrings is a work in progress. The Irish Gift House is currently searching for additional selections that we may offer. Please check back often; you never know what we will find. 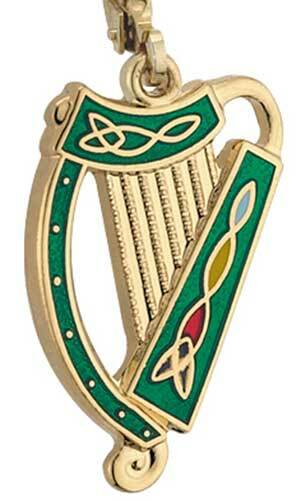 Irish harp earrings features a gold plated finish with enamel accenting along with a Celtic knot motif. Irish harp earrings features a gold plated finish with enamel accenting along with a Celtic knot design. Sterling silver Irish harp earrings are studs that feature marcasite stones and green enamel accenting. 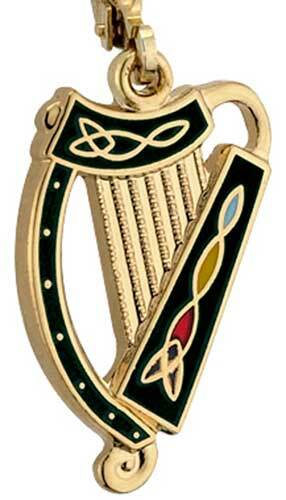 Add a stunning Irish harp necklace to your earrings and everyone will know that you are proud of your heritage. You may also wish to consider one of our Irish harp brooches; they may prove to be one of the most versatile pieces in your collection by adding a little excitement to your wardrobe. The Irish Gift House also features a grand selection of Irish harp charms that may be added to your existing chain or bracelet.